Aardman was founded in 1972 as a low-budget project by Peter Lord and David Sproxton, who wanted to realise their dream of producing an animated motion picture. The partnership provided animated sequences for the BBC series for deaf children Vision On. The company name originates from the name of their nerdish Superman character in that sequence. After creating a segment called "Greeblies" (1975) using clay animation, became what was the inspiration for creating Morph, a simple clay character. Around the same time Lord and Sproxton made their first foray into adult animation with the shorts Down and Out and Confessions of a Foyer Girl, entries in the BBC's Animated Conversations series using real-life conversations as soundtracks. Aardman also created the title sequence for The Great Egg Race and supplied animation for the multiple award-winning music video of Peter Gabriel's song "Sledgehammer". They produced the music video for the song "My Baby Just Cares For Me" by Nina Simone in 1987. Later Aardman produced a number of shorts for Channel 4, including the Conversation Pieces series. These five shorts worked in the same area as the Animated Conversations pieces, but were more sophisticated. Lord and Sproxton began hiring more animators at this point; three of the newcomers made their directorial debut at Aardman with the Lip Synch series. Of the five Lip Synch shorts, two were directed by Lord, one by Barry Purves, one by Richard Goleszowski and one by Nick Park. In 1991, Park's short, Creature Comforts, was the first Aardman production to win an Academy Award. Park also developed the clay modelled shorts featuring the adventures of Wallace and Gromit, a comical pair of friends: Wallace being a naive English inventor with a love of cheese, and Gromit his best friend, the intelligent but silent dog. These films include A Grand Day Out (1989), The Wrong Trousers (1993) and A Close Shave (1995), the latter two winning Academy Awards. In December 1997, Aardman and DreamWorks (later DreamWorks Animation) announced that their companies were teaming up to co-finance and distribute Chicken Run, Aardman's first feature film, which had already been in pre-production for a year. On 27 October 1999, Aardman and DreamWorks signed a $250 million deal to make an additional four films that were estimated to be completed during the next 12 years. Along with the deal their first project was announced, titled The Tortoise and the Hare. Intended to be based on Aesop's fable and directed by Richard Goleszowski, it was put on hold two years later because of script issues. On 23 June 2000, Chicken Run was released to a great critical and financial success. In 2005, after ten years of absence, Wallace and Gromit returned in Academy Award-winning Wallace & Gromit: The Curse of the Were-Rabbit. The following year Flushed Away, Aardman's first computer-animated feature, was released. On 1 October 2006, right before the release of Flushed Away, The New York Times reported that due to creative differences DreamWorks Animation and Aardman would not be extending their contract. The deal was officially terminated on 30 January 2007. According to an Aardman spokesperson: "The business model of DreamWorks no longer suits Aardman and vice versa. But the split couldn't have been more amicable." Unofficial reasons for departure were weak performances of the last two movies, for which DreamWorks had to take writedowns, and citing the article, "Aardman executives chafed at the creative control DreamWorks tried to exert, particularly with Flushed Away..." The studio had another film in development, Crood Awakening (eventually The Croods), which had been announced in 2005, with John Cleese co-writing the screenplay. With the end of the partnership, the film's rights reverted to DreamWorks. On 10 October 2005, a serious fire at a storage facility used by Aardman and other Bristol-based companies destroyed over 30 years of props, models, and scenery often built by the Bristol-based Cod Steaks. This warehouse was used for storage of past projects and so did not prevent the production of their current projects at the time. In addition, the company's library of finished films was stored elsewhere and was undamaged. An electrical fault was determined to be the cause of the blaze. Referring to the 2004 South Asia earthquake and tsunami, Park was quoted as saying, "Even though it is a precious and nostalgic collection and valuable to the company, in light of other tragedies, today isn't a big deal." From 2006 to 2007, the Ghibli Museum in Mitaka, Tokyo, Japan, had an exhibit featuring the works of Aardman Studios. Sproxton and Lord visited the exhibit in May 2006 and met with animator Hayao Miyazaki during the visit. Miyazaki has long been a fan of Aardman Animations' works. In April 2007, Aardman signed and in 2010 renewed a three-year deal with Sony Pictures Entertainment to finance, co-produce, and distribute feature films. The next year, Aardman released a new Wallace and Gromit short film, called A Matter of Loaf and Death. The first film made in partnership with Sony was the computer-animated Arthur Christmas (2011), which is Aardman's first 3-D feature film. 2012 saw the release of The Pirates! In an Adventure with Scientists! (known internationally as The Pirates! Band of Misfits), Aardman's first 3-D stop-motion film and Peter Lord's first film as a director since Chicken Run. An additional two films were announced in June 2007: The Cat Burglars, a stop-motion film directed by Steve Box, about cats that steal milk, and their plans to pull off 'the great milk float robbery'; and an untitled Nick Park project (eventually titled Early Man). Aardman is also known to provide generous resources and training to young animators by providing awards at various animation festivals. For example, The Aardman Award at the UK's Animex Festival in Teesside provides story consultation to a promising young animator for their next film. In 2008, Aardman joined with Channel 4 and Lupus Films to launch a user-generated content animation portal called 4mations. They also designed the BBC One Christmas Idents for that year, which featured Wallace and Gromit to tie in with the showing of the new Wallace and Gromit film called A Matter of Loaf and Death on Christmas Day at 8:30pm. In April 2008, Aardman launched the Aardman YouTube channel, which is a YouTube Partner channel featuring the entire Creature Comforts TV series, the Morph series, Cracking Contraptions and clips from the Wallace and Gromit films. From December 2008, Aardman also started posting various flash games on Newgrounds, the majority of which are based on Wallace and Gromit and Shaun the Sheep. In 2009, Nintendo announced that Aardman would make twelve short films using only Flipnote Studio from Nintendo DSi. The films were posted on Flipnote's Hatena web service provider. The first film was called The Sandwich Twins and was released on 16 September 2009. The remaining eleven films were released on a weekly basis until Christmas, and can also be downloaded using Hatena. 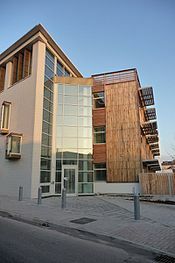 In 2009 the headquarters of the company moved into a new building, designed by Alec French architects, in Gas Ferry Road, Bristol, although work needing large-scale sets is still carried out in sheds in Aztec West and Bedminster. In October 2013, Peter Lord (co-founder of Aardman Animations) created a fund raising project on the crowdfunding site Kickstarter. The campaign has a target of £75,000 which will be used to fund 12 new one-minute episodes of Morph. Lord is hoping to start production in January 2014 using the original stop-frame animation. Backers of the project will receive a variety of rewards, including early access to the new animations and a small box of clay used in the production, depending on the individual's level of funding. In 2015, the company bought a majority share in New York-based animation studio Nathan Love, announcing the merger with a short film called Introducing: Aardman Nathan Love in 25 September of the same year. In advance of Aardman's fortieth anniversary, BBC One aired the one-hour television documentary A Grand Night In: The Story of Aardman, first broadcast on December 2015. Narrated by Julie Walters, this career retrospective includes commentary by the company's founders and staff, as well as various friends, fans and colleagues including Terry Gilliam, John Lasseter, and Matt Groening. From 29 June 2017 to 29 October 2017, an exhibition entitled "Wallace and Gromit and Friends" was shown at the Australian Centre for the Moving Image (ACMI). A report on this exhibition was shown on Australian ABC News Breakfast on Wednesday, 28 June, featuring an 8-minute interview with producers Peter Lord and David Sproxton. The exhibition revealed that in Nick Park's very early sketches, Gromit was originally a cat, but Park soon changed him into a dog, since it was generally agreed that a dog was clearly more suitable as a loyal pet/companion than a cat and also because a dog would be easier to make and animate in Plasticine. Embedded in the ABC News article is a video interview with Lord and Sproxton, which gives information not only on Wallace and Gromit, but also Shaun the Sheep and others. On 9 November 2018, Aardman Animations announced that Peter Lord and David Sproxton would be transferring majority ownership of the company to its employees in order to keep the company independent. In January 2019, Lord and Sproxton released a book detailing the history of the studio, called A Grand Success! The Aardman Journey, One Frame at a Time. The company name is taken from one of its early characters, a superhero created for Vision On in 1972. Unlike the claymation productions that the company are famous for, Aardman was cel-animated. Peter Lord has stated that the most interesting thing about the company name is that it “means nothing” and is only a joke that two teenagers found funny. He has stated that the name came from a combination of “Aardvark” and “Superman” for the reason that they found aardvark to be a particularly funny word. The title character's name of the animation became their company name when the BBC asked them who they should make their first cheque out to. Co-founder David Sproxton has claimed that the name was a result of being unable to "find another word with more A's in it than 'aardvark'" as a schoolboy. A number of Aardman directors have worked at other studios, taking the distinctive Aardman style with them. Aardman's Steve Box directed the animated music video for the Spice Girls' final single as a five-piece, "Viva Forever". Widely regarded as the Spice Girls' most critically acclaimed song, the video took over five months to produce, considerably longer than the group's box office hit movie, Spice World. Barry Purves, director of the Aardman short Next, also directed Hamilton Mattress for Harvest Films. The film, a half-hour special that premiered on Christmas Day 2001, was produced by Chris Moll, producer of the Wallace and Gromit short film The Wrong Trousers. The models were provided by Mackinnon & Saunders, a firm that did the same for Bob the Builder and Corpse Bride. Similarly, Robbie the Reindeer in Hooves of Fire, a BBC Bristol/Comic Relief production, was directed by Richard Goleszowski, creator of Rex the Runt. Its sequel, Robbie the Reindeer in Legend of the Lost Tribe, was directed by Peter Peake, whose directorial credits for Aardman include Pib and Pog and Humdrum. Aardman alumni also produced many of the claymation shorts used in the 1986–1990 American television series Pee-wee's Playhouse. The works of Aardman have received numerous awards and nominations, the major awards won include the Academy Award for Best Animated Feature and BAFTA Award for Best British Film for Wallace & Gromit: The Curse of the Were-Rabbit. ^ a b "Aardman". Box Office Mojo. Retrieved 26 July 2015. ^ Wheatley, Cliff (17 June 2014). "Top 10 DreamWorks Animation Movies". IGN. Retrieved 26 July 2015. Impressively, Chicken Run is still the highest grossing stop motion animated movie of all time. ^ "Aardman Animations - Aardman History". www.telepathy.co.uk. Retrieved 2018-03-17. ^ Lane, Megan (14 October 2010). "What's an egg race got to do with inventing?". BBC News. Archived from the original on 10 November 2010. Retrieved 17 November 2010. ^ "Chicken Run: Deal clinched with DreamWorks & Pathe". Telepathy Ltd. 3 December 1997. Retrieved 30 August 2011. ^ Gibbons, Fiachra (29 October 1999). "Wallace and Gromit's Hollywood deal:Steven Spielberg's DreamWorks signs $250m agreement with animation company that began on kitchen table in Bristol". The Guardian. Retrieved 17 November 2010. ^ Moerk, Christian (27 October 1999). "DW-Aardman pact drawn". Variety. Retrieved 3 September 2011. ^ Dawtrey, Adam (20 December 1999). "Aardman's 'Hare' to run with Goleszowski". Variety. Retrieved 8 December 2010. ^ Linder, Brian (7 July 2001). "Aardman Halts Tortoise vs. Hare". IGN. Retrieved 8 December 2010. ^ a b M. Holson, Laura (3 October 2006). "Is Th-Th-That All, Folks?". The New York Times. Retrieved 17 November 2010. ^ a b c d Fritz, Ben (30 January 2007). "Aardman, DWA end partnership". Variety. Retrieved 18 November 2010. ^ "DreamWorks and Aardman Are in for a 'Crood Awakening'". ir.dreamworksanimation.com (Press release). DreamWorks Animation SKG. 12 May 2005. Archived from the original on 12 July 2012. Retrieved 8 December 2010. ^ BBC News (9 December 2005). "Aardman fire caused by electrics". BBC News. Retrieved 17 November 2010. ^ breakingNEWS.ie (10 October 2005). "Nick Park: Aardman fire 'no big deal' in world context". breakingNEWS.ie. Retrieved 17 November 2010. ^ The Japan Times (24 November 2006). "Ghibli brings claymation to Tokyo: Aardman exhibits, new Miyazaki anime on view". The Japan Times. Retrieved 12 March 2019. ^ Mulrooney, Marty (27 November 2009). "INTERVIEW – In Conversation With Merlin Crossingham, Lead Animator At Aardman Animation". Alternative Magazine Online. Archived from the original on 16 November 2010. Retrieved 7 November 2010. ^ BBC News (2 April 2007). "Gromit animators sign Sony deal". BBC News. Retrieved 7 November 2010. ^ Debruge, Peter (18 December 2010). "Aardman charts new course with Sony". Variety. Retrieved 24 January 2011. ^ "Aardman reveals new slate". Variety. 18 June 2007. Retrieved 26 March 2012. ^ Hofferman, Jon (12 September 2007). "Animex Adds Aardman Award". Animation Magazine. Retrieved 26 November 2010. ^ Kiss, Jemima (28 August 2008). "Channel 4 creates 'home for animation'". guardian.co.uk. London. Archived from the original on 17 May 2009. Retrieved 24 April 2009. ^ Holmwood, Leigh (15 October 2008). "Wallace and Gromit get YouTube channel after Aardman deal". Guardian.co.uk. Retrieved 17 November 2010. ^ Wildgoose, David (27 August 2010). "LunchTimeWaster: The Physics Of Sheep". Kotaku. Retrieved 17 November 2010. ^ Nintendo (10 September 2009). "Oscar-winning Aardman Studios to create 12 Films of Christmas with Nintendo". nintendo.co.uk. Nintendo. Retrieved 18 November 2010. ^ Mellor, Penny (2013). Inside Bristol: Twenty Years of Open Doors Day. Redcliffe Press. pp. 12–13. ISBN 978-1908326423. ^ "All New Adventures of Morph from Aardman Animations". Kickstarter. Retrieved 2 November 2013. ^ "'Bring back Morph' campaign launched by Aardman". BBC News. 30 October 2013. Retrieved 2 November 2013. ^ Spangler, Todd (23 September 2015). "Aardman Buys U.S. Animation Studio Nathan Love". Variety. Retrieved 10 October 2015. ^ Amidi, Amid (22 September 2015). "Aardman Buys Majority of Nathan Love to Create US-Based Aardman Nathan Love". Cartoon Brew. Retrieved 22 October 2015. ^ Hegarty, Tasha (9 December 2015). "Aardman is celebrating its 40th anniversary this Christmas with BBC documentary A Grand Night In on Boxing Day". Digital Spy. Retrieved 2 December 2016. ^ Wood, Patrick (ABC News). "'Wallace and Gromit creative duo open Australian exhibition'". ^ "Video interview with Peter Lord and David Sproxton". ^ Ritman, Alex (November 9, 2018). "'Wallace & Gromit' Producer Aardman Animations Transfers Ownership to Employees". The Hollywood Reporter. Retrieved November 10, 2018. ^ Canfield, David. "Inside the making of 'Chicken Run,' the highest-grossing stop-animation film of all time". EW.com. Retrieved 2019-02-14. ^ Parsons, Caron. "An animated history". BBC. Retrieved 21 October 2015. ^ "Aardman Animations". screenonline.org. BFI. Retrieved 21 October 2015. ^ "Aardman Podcast Episode 1: The Early Days". aardman.com. Aardman. Archived from the original on 25 May 2014. Retrieved 23 May 2014. ^ Lloyd, Robert (10 July 2006). "Pee-wee's back in the limelight". Los Angeles Times. Archived from the original on 8 September 2012. Retrieved 12 March 2015. The show is nevertheless full of marvelous animated sequences, some by Peter Lord and Nick Park of Aardman Animation/"Wallace & Gromit" fame. ^ Dawtrey, Adam (20 December 1999). "Aardman's 'Hare' to run with Goleszowski". Variety. Retrieved 12 March 2015. Goleszowski has been part of the Aardman family since joining the company in 1983. He stayed for nine years, working on projects including Peter Gabriel’s “Sledgehammer” video and “Pee Wee’s Playhouse” in New York before going freelance. Wikimedia Commons has media related to Aardman Animations.